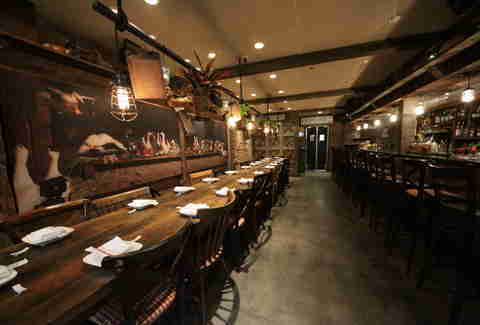 From the team behind RedFarm, Decoy is a Peking duck lair in the space directly below the popular West Village Chinese spot -- which formerly housed its temporary, underground steakhouse -- and now looks a bit like the basement of an artsy farmer who loves a good cocktail and expertly cooked, whole, crisp-skinned juicy ducks. 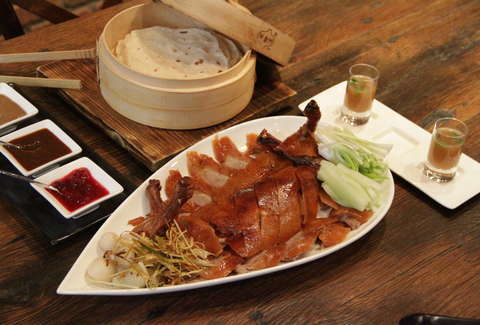 You need to make a reservation (because they only serve 24 ducks per night), but once you do, here's how it works: you get one whole duck automatically, and then you get to choose small plates, a side dish or veggie fried rice, and a main in different amounts (no mains for two, or two mains for four, for example). Any way you do it, it's actually a pretty decent deal. Here it is, in all its splendor. It comes with a warm shot of duck consommé, onions, scallions, cucumbers, impossibly thin-yet-sturdy pancakes, Decoy "chips" (actually fried branzino skin), and three sauces (the standard hoisin, sesame, and cranberry). The mains are also available à la carte, as well, including the Pork Toro with Korean rice cakes (made with the jowl, which the chef considers the "best part"). 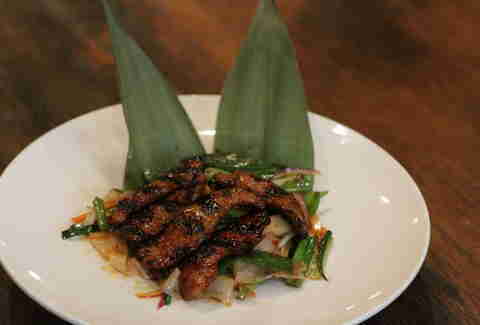 The dish has a rich, sweet, meaty flavor with some chewiness from the cakes. This small plate is cold sweet potato noodle salad with Spring veggies. 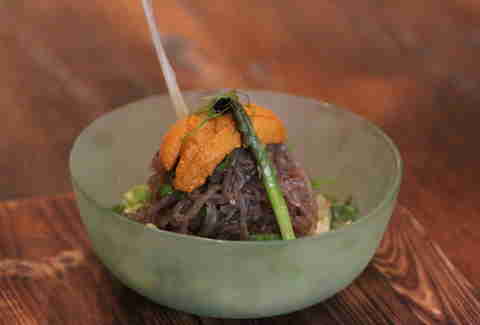 You have the option to top this off with some uni fresh out of the shell. Choose that option. 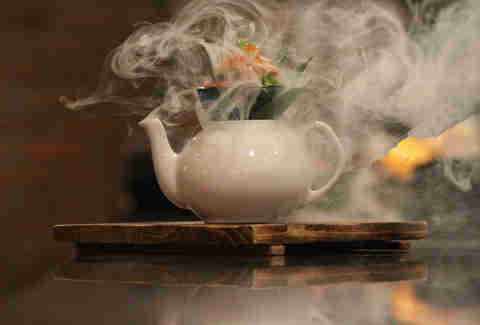 This theatrical small plate is the octopus salad with cucumber that's topped off with roe and served in a tea pot loaded with dry ice, which flows out of the spout. It's impressive. 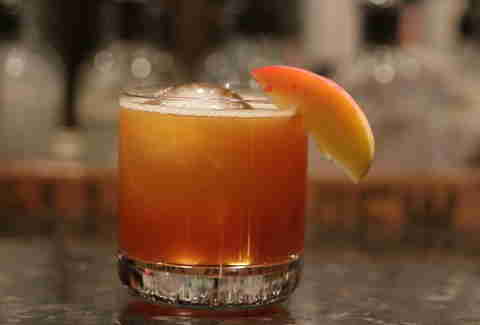 The bar, which you don't need a reservation for and you can get snacks at, sadly won't give you duck, but they will load you up with tasty cocktails... including the Ain't That A Peach, with whiskey, peach shrub, Meletti, Averna, lemon, peach bitters, and Allman Brothers vibes. 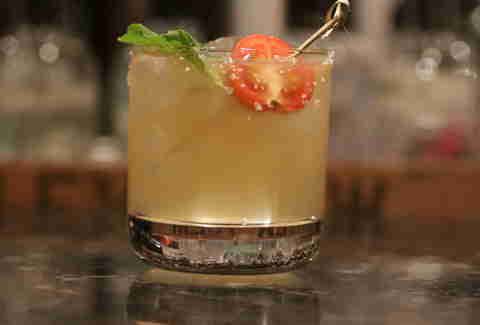 Also at the bar is this slightly savory Flawless tipple, which's loaded with gin, lemon juice, rice vinegar, simple syrup, muddled tomato/basil, and a rim of Manzanilla salt... ensuring the duck's not the only thing properly sauced once dinner begins. Andrew Zimmer is Thrillist's NYC Editor. 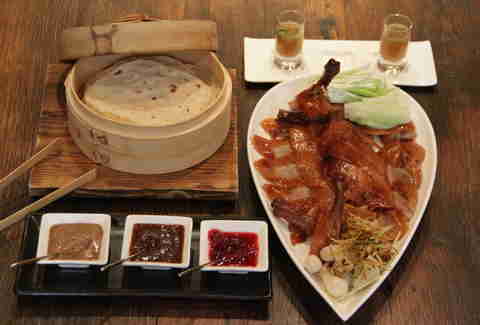 He discovered Peking duck at age 11, and ate it every single time he got Chinese food for the next five years. Follow him on Twitter and Instagram.